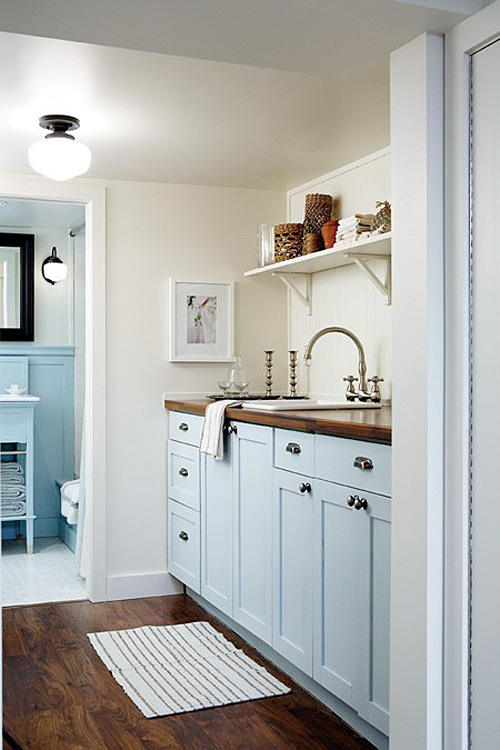 And the winner is… pale blue! As I had mentioned, I’m not normally a fan of blue. I like certain shades though, so I’m willing to give it a shot. This laundry room may have tipped things in the color’s favor. Plus, I do love blue with red, so I think the color will look beautiful with our red washer and dryer. 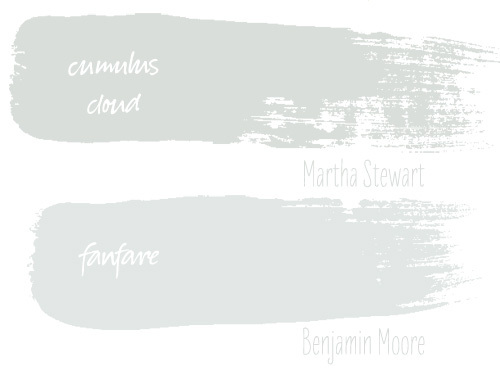 I’m having Martha Stewart’s “Cumulus Cloud” color-matched to Benjamin Moore, but if you’re looking for an existing B. Moore color, it’s close to “Fanfare.” A nice grayish blue. I’m also painting the storage/tool room in this color. It will look great with the olive painted floor! The only room I have left now is the half-bathroom — I have no idea what color I’m putting in there. Cumulus looks greenish gray on my monitor. That makes me worry that my monitor isn’t calibrated correctly and all my pictures this week have been edited to look like red fireballs. Ugh. It’s a little greenish. The fanfare color and the laundry room photo are more blue. Missed this post. Pretty pales. Either is fine. What are the appliances colors? Probably red, as in your previous house which was so nice looking. If our (finished)basement was brighter, I’d go with more color. Blue appliances were my first pick. Had to choose white though. Looks very good with grayish-blue background + assorted old pics, etc. of wash products that pop lots of color. I heart the cumulus cloud color! I think it will look great against the red washer and dryer. As for the bathroom – what about a tone on tone horizontal stripe with white and off-white (or something similar)? Oooo – I remember the pictures for the entire basement reno that laundry shot is from. It didn’t even look like a basement! I am so jealous of unbasement-y basements. Pale blue will look so pretty with the red washer/dryer. Lovely! I think that will look great with your red machines! Oh no! I have to tell you how upset I am that you have alerted me to the existence of wallpaper at anthropologie. Ugh. That Lofty Larks paper is simply too cute. Man, I wish my laundry room looked like that! I love that blue laundry room. We’re building my daughter a play kitchen & the 2 main colors are pale blue & red. I think your basement is going to look great! Sheri @ Make It POP! That is a really clean-looking color. Love. SO pretty!!! 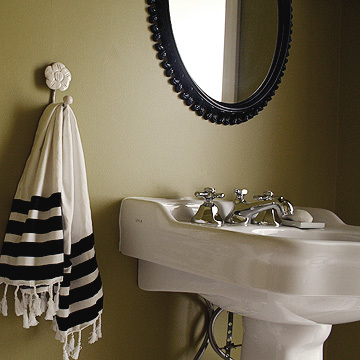 For the powder room…what if you did a light olive on the walls? With all white, big fluffy towels?? It would be a nice transition from the olive floors in the rest of the rooms. We can’t wait to see photos! I am going to want to move in to your basement, because it’s going to be so beautiful down there. Ooh, I can’t wait to see how everything comes together! Love your choices so far! I’m loving fanfare! I’ve been looking for a pretty gray. I guess I don’t look at those swatches and see blue – more like a pale gray. Hmm. Can’t wait to see the color combo! good choice. i am a fan of light blue + red. a question. dose that mister weigh in with his opinion on these things? does he care? i am single so the only person i have run design decisions by is my dog. heh. You always pick the prettiest colors! I love the Wild Aster on yours walls, but on the paint chip it doesn’t look that pink. Can’t wait to see the finish basement! I love all the painting tips! I wish you lived closer to Utah. We are are about to redo the living room. Paint scares me sooo bad! they’re both so beautiful it’s hard to decide. but i do see why that image inspired you. it’s beautiful. I live that color! I used it in a clients guest room. The real reason I’m commenting; Jubilee (have you been there?) has a gorgeous, quirky, wooden frame mirror similar to the one you posted a few weeks ago, in case you’re still planning on going that direction. love^…. I was so excited about the color I made a typo! I love it. It looks warm and inviting! yay yay yay…….for selfish reasons, i can’t wait to see a mood board for your laundry room when you accessorize it….mine is pale blue too….. was thinking of red pops of ikea pots.. but never got down to it…. Realyy nice choice of color for the laudry room!!! It’s fresh, calm and totally look clean! But i prefer a frame for the mirror and maybe just the upper part of the wall with wallpaper.. A graphic one, a trellis pattern maybe??? And why not the selling to! is it weird to say I’m getting excited?! :) I can’t wait to see how it turns out. Love blue in a laundry room. What about a more vintagey green in the half-bath? Something like Martha Stewart Beryl. It might look nice with the retro fixtures. Ahhh, I love a good grayish blue. 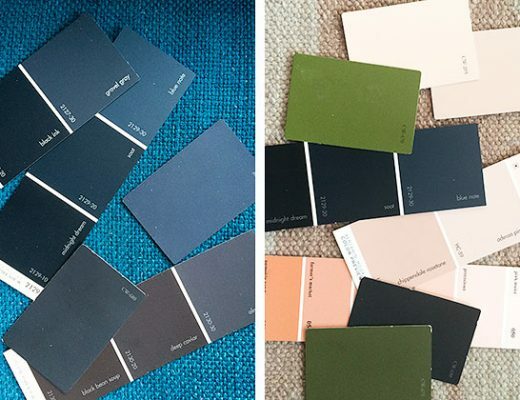 Love the color choices…You need to look at wales gray…one of the Ben Moore colors for west elm…so nice…can’t wait to see the finished basement. Blue and red together is amazing. Good choice! Good choice, I never pick cool colors but I took a chance on a bluish grey for my bedroom (BM winter solstice) and it really grew on me. Can’t wait to see how it turns out! This is kind of a wild idea for the half bath, but it could be great: random width horizontal stripes using all the basement colors. I have seen this implemented to great effect in a living room (with all white furniture — in your case, white fixtures serve the same function) and in a kitchen. I seriously love this! Would be so fun for a laundry room. Hmmm might have to copy you. I do so adore the blue + red combo. I bet the laundry room will be so very pretty. I mean, everything you touch turns to gold..err..prettiness! Can’t wait to see it! Wonderful color ideas! Thanks so much for posting this. The laundry room photo you posted is perfect inspiration for my kitchen. I love your blog, just fab. I have a question for you and I hope it is not too cheeky….I have been looking forever for an app or similar that can show a graphic similar to yours for paint color – ie the brushstoke look. I have been searching for months and would so appreciate being pointed in the right direction.